Not all cholesterol is created equal. Cholesterol — a waxy substance made by the body and found in some foods — is something the body needs, at least in small amounts. But increased blood levels of cholesterol — particularly the LDL or "bad" cholesterol — had been linked to a greater risk of heart disease. Cutting back on dietary fat and cholesterol is a great place to start in lowering your LDL, but ensuring you eat more of the right foods is also important. Read on to find out what types of foods can lower the LDL cholesterol and provide other heart health benefits. Time to go nuts! They're a great source of polyunsaturated fatty acids (PUFA) and monounsaturated fatty acids (MUFA) — heart-healthy fats that help improve cholesterol levels. These nutrient-dense snacks also contain a variety of vitamins and minerals, along with fiber, antioxidants and phytosterols — plant compounds similar to cholesterol which limit the amount of cholesterol absorbed into the bloodstream. While walnuts, almonds, peanuts and pistachios are commonly touted for their heart health benefits, nuts in general can lower cholesterol levels — according to a 2010 analysis of 25 studies that linked about two handfuls of nuts per day to a 10-point drop in LDL levels. Whole oats, including oatmeal, oat flour and oat bran, are also well known for their cholesterol-lowering properties. Oats are rich in beta-glucans, a soluble fiber that forms a gel-like substance in the intestines. This soluble fiber is believed to reduce blood levels of LDL by interfering with gut absorption of fat and cholesterol. Health claims approved by the U.S. Food and Drug Administration (FDA) state that 3 grams of beta-glucans per day (the amount found in 1.5 cups of cooked oats) can reduce LDL cholesterol by 5 to 10 percent. Whole grain barley is also rich in beta-glucans, and like oats, has similar LDL-lowering properties. Barley contains nearly 3 grams of beta-glucans per cup, a bit more than the amount found in oats — provided the barley is whole grain, and not pearl barley or the quick-cooking variety. Barley also contains phytosterols and lignans, which may help lower LDL, along with other plant chemicals (phytonutrients) that exhibit antioxidant and anti-inflammatory effects. Barley is a great addition to soups and salads, and barley flakes are a tasty alternative to oatmeal. Avocado is rich in MUFA, fiber and phytonutrients like phytosterols and polyphenols — all of which are linked to improved blood cholesterol levels. One 2015 study found a 13-point LDL reduction in participants who consumed a moderate-fat diet which included one fresh avocado daily. This was almost double the drop compared to the two other study diets — a nearly identical diet with no avocado and a lower fat diet. In addition, the avocado diet in this study was most effective at lowering the small, dense LDL — which poses a greater risk of heart disease compared to the large, fluffy LDL. Whole soy foods, including edamame, tofu or soy milk, are known for their high-quality plant protein, antioxidants, fiber and estrogen-like compounds. At face value, the cholesterol benefits from this legume may seem modest — a 4 to 5 percent reduction in LDL from 25 grams of soy protein, or the amount found in 10 ounces of tofu or 2-1/2 cups of soy milk. However, authors of a December 2010 review estimate the actual LDL reduction may be as high as 10 percent — if soy replaces foods known to raise cholesterol, such as high fat meats, whole milk and cheese. Beans, peas and lentils, also categorized as legumes, have many qualities that make them an asset to a cholesterol-lowering diet. Legumes are naturally low in fat, high in soluble fiber, a source of phytosterols, and particularly good sources of folate, iron, zinc, magnesium and antioxidants. These plant proteins add LDL-lowering phytonutrients to the diet, and can be particularly valuable when replacing foods — such as fatty meats — which can increase cholesterol levels. A 2012 analysis of 10 research trials demonstrated an average of 8-point LDL reduction in diets supplemented with at least 1/2 cup of daily beans, peas or lentils. Let's hear it for berries! A 2016 analysis of 22 research trials linked daily consumption of berries, berry juice or berry extract to a nearly 4-point reduction in LDL. Although this may appear a small change, berries — and many whole plant foods — do more than affect the numbers. LDL is more likely to deposit in the arteries and cause damage when it oxidizes, and antioxidant-rich berries can counter this damaging effect. In addition, anthocyanins, a phytonutrient found abundantly in blue, purple and red berries, can prevent the inflammation and blood vessel dysfunction linked to heart disease. Here's one that should come as no surprise. A diet that emphasizes all fruits and vegetables can lower LDL cholesterol and reduce heart disease risk. Fruits and vegetables are abundant in vitamins, minerals, fiber and phytonutrients which provide anti-inflammatory and antioxidant benefits. A 2004 study of nearly 4,500 subjects linked more than five daily servings of fruits and vegetables to a 6 to 7 percent reduction in LDL — compared to adults consuming less than two servings daily. Small drops in LDL are important, as every one percent reduction is associated with 1 to 2 percent fewer cardiovascular disease events, such as heart attack and stroke. Good news for your sweet tooth: Daily chocolate — 1/4 cup cocoa or 100 grams of dark chocolate — may decrease LDL levels by about 6 percent, according to a 2011 research analysis of 10 clinical trials. This amount may not be practical or wise to consume, however, since a 100-gram chocolate bar contains over 500 calories. But chocolate appears to have cardiovascular benefits which go beyond LDL-lowering. A 2015 European study of nearly 21,000 adults linked 25 grams of daily chocolate to a lower risk of heart attack and stroke, presumably due to cocoa's flavonoid content, which provides antioxidant and anti-inflammatory benefits. So enjoy in moderation. Aside from eating all the previously mentioned foods, a powerful approach to reducing the risk of heart disease is to eat according to a healthy food pattern. Perhaps one of the best studied diets is the Mediterranean diet, a plant-centered way of eating which has been shown to reduce the risk of heart attack and stroke by at least 30 percent. 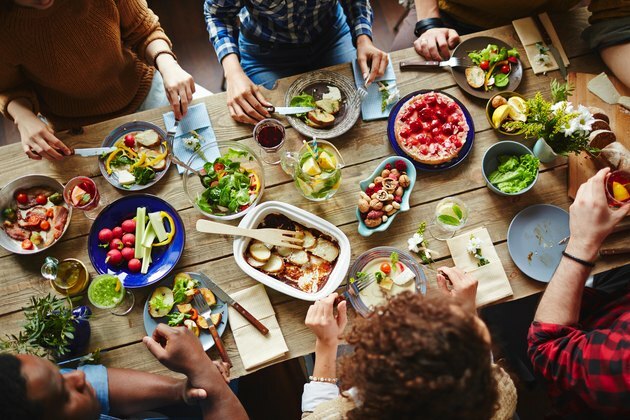 A healthy diet pattern does what individual foods or supplements can't do — enable nutrients and compounds from a variety of whole foods and food combinations to work in synergy to nourish the body, improve health and reduce the risk of heart disease.